Make your free 2019 photo calendar for free! Build your own custom photo calendar using our picture calendar template! Our blank photo calendar template can be updated with the selected month, day and photos! Then print, fold in half and staple to create your custom calendar! 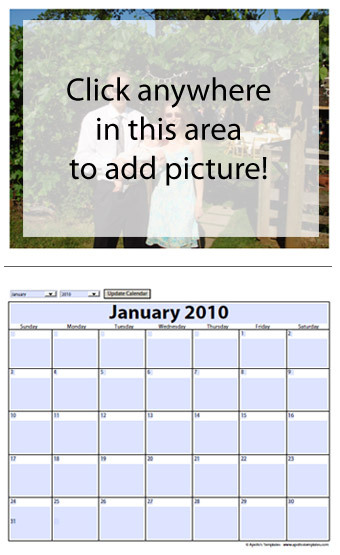 Create a special family calendar or work related calendar with pictures and print. We provide the instructions below! Build your April 2019 Calendar Now! Please be patient while downloading the calendar template as file sizes are large. Step 2 - Customize Calendar Template and Print! 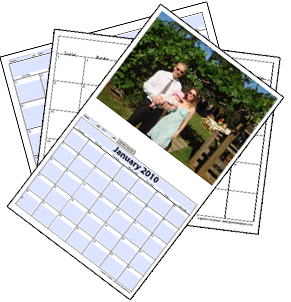 Once you have downloaded your free photo calendar template in step 1, you can select the appropriate month and year. Then click "Update Calendar". This will auto build your calendar for that month. From there you can edit nearly ever aspect of the page prior to printing. This is indicated with the instructions to the right. Next, click on the top portion of the PDF document above the calendar. You will see a box pop-up allowing you to select the appropriate photo from your computer to add to the calendar. Unfortunately there are limitations with Adobe and vertical pictures will end up left justified unless you alter their shapes to be horizontal prior to adding to your calendar template. Make sure to use a picture of high quality, otherwise image quality will be poor when you print. This template is formatted for legal paper (8.5" X 14" as opposed to 8.5" X 11"). It still works with the smaller paper, but it is way more cool with the other size! If you wish to create a full calendar, create the desired templates, fold in half, then staple or fasten in the center of the calendar to create your own custom photo calendar! Create your own special calendars for holidays and special events such as Christmas, New Years, Halloween, Baby Showers, Valentines Day, Birthday, Wedding, Bridal Shower, Retirement Parties or even Easter! Note: Remember that you can't save changes to your printable Calendars after making them - so remember to print. Purchasing a copy of Adobe Acrobat Professional will allow you to save these templates. These Calendar templates are free of any charge and of course you aren't required to link to our website, but it is a way to thank us for this free service. A link would be appreciated if you have a blog or website. Click here for link instructions. If you don't have a website to add us too, just remember to bookmark our website and maybe refer a friend. Making life a little easier with our free Calendar Templates!